A beautiful and easy to use editor for the popular Markdown markup language, combined with a themed live preview feature, you will never have to write boring documents again. Mavericks is fully supported now. 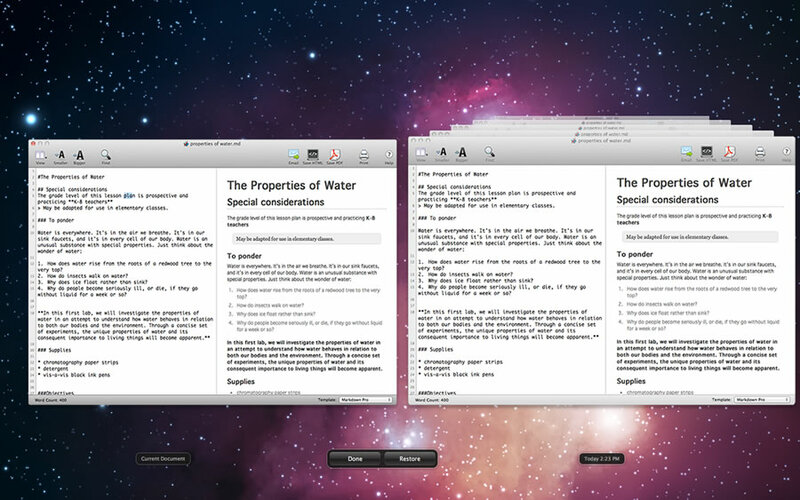 Also, you can now edit your iCloud stored markdown documents. Middle eastern languages such as Hebrew and Arabic are written predominantly right-to-left. 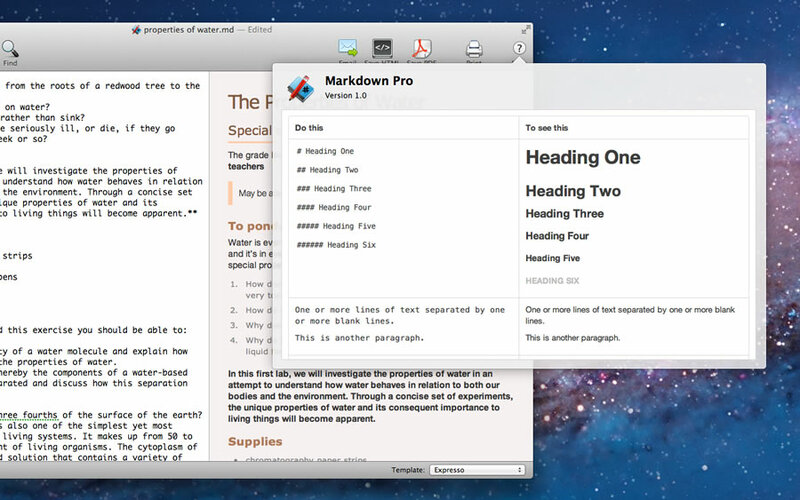 Markdown PRO supports preview in Right-to-Left mode. Just go to preferences and turn this feature on or off. Markdown PRO allows you to not only write using the markdown syntax, but instantly gives you a live preview of how your formatted text will look like!. 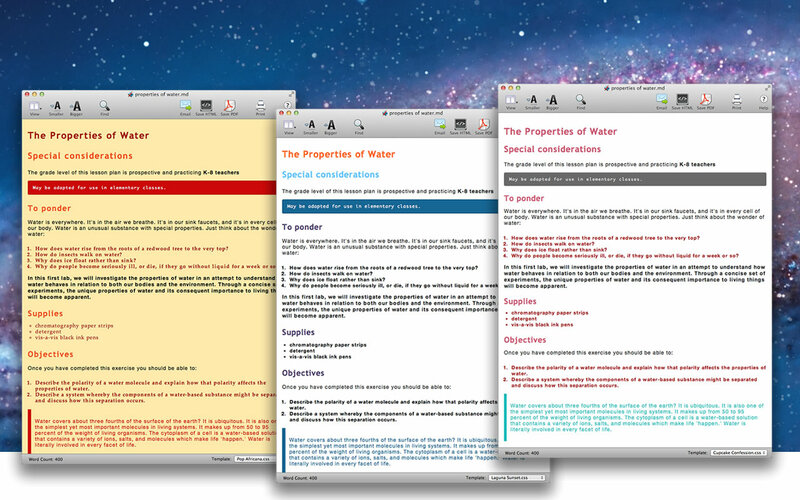 On top of that, it provides a few beautiful templates you can use to impress your friends, family or colleagues with. Help is never far away. Just click on the Help button. Markdown is a simple text formatting language for all your writing needs; it is a way to format your text adding italic and bold text, headings, notes, images, and more, allowing you to focus on the writing and not on the look! Thanks again to all our users for their feedback! By popular demand, Markdown PRO now lets you add your own custom template to the template list so you can add a personal touch to your work of art. 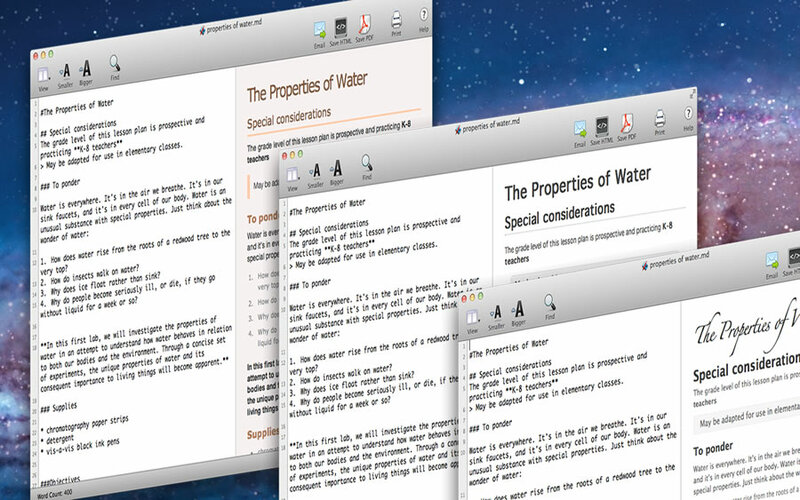 We created this application for OS X Mavericks, ensuring that you can utilize the new cool features the operating system gives us, and we took advantage of that with Markdown Pro. Markdown Pro editor can run in full-screen mode, allowing you to focus on your work and remove distractions from your screen. 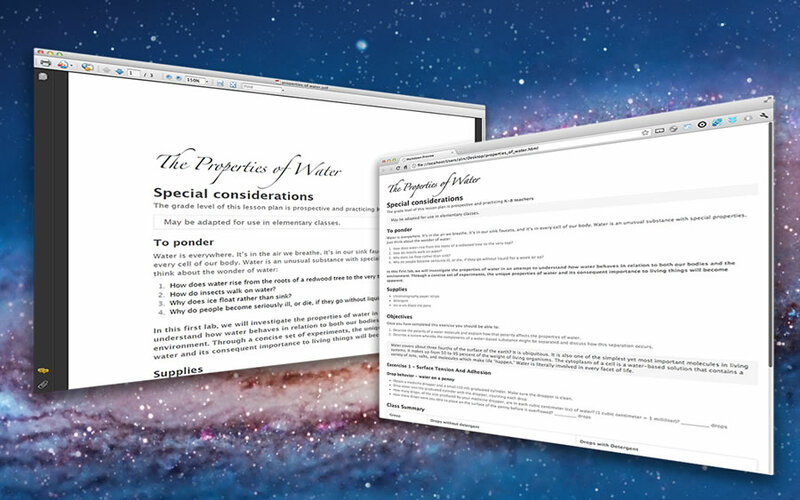 We utilize the native OS X Mavericks full-screen support and you can open more than one document in full-screen. 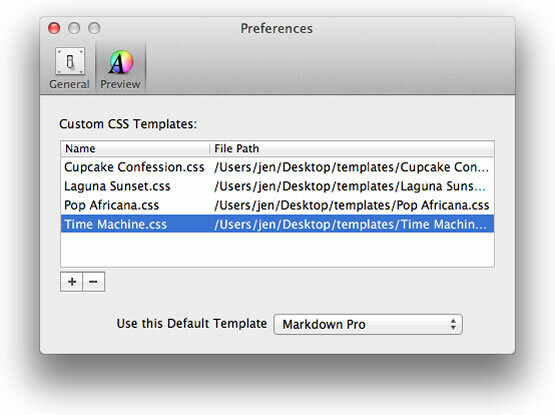 It’s time to stop worrying about saving your work all the time. 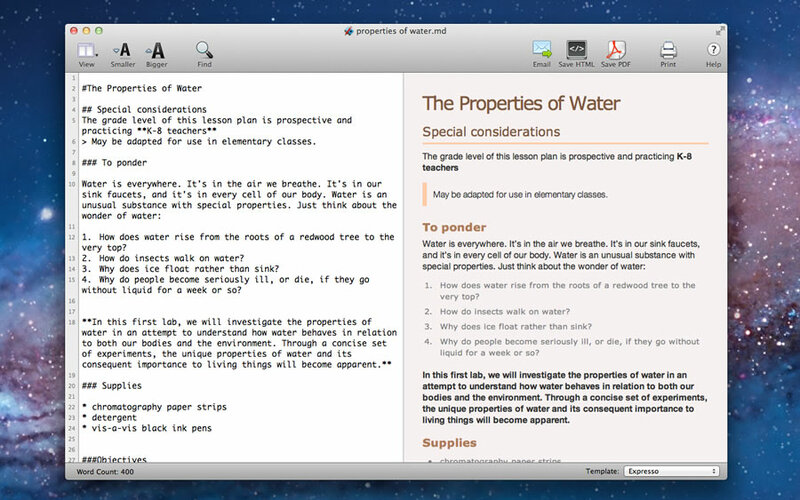 With that in mind, we decided to leverage a new feature of OS X Mavericks to save your work automatically. Now there's no need for you to remember to press Command-S to save your work. If you close our application it will reopen right where you left off, so you never have to look for the last document you were working on. You can simply resume what you were doing before, even after you reboot your computer. You remember the time when you are working on a document and regret changes you made, but it is too late because you already saved it? Just go to File -> Revert to saved and choose the version you want to revert to. You can easily export the document to an Adobe PDF file or HTML format. Share your work with colleagues, friends and family. We are always looking for feedback and want to hear from you! © 2011-2014 RADSense Software Inc. All rights reserved.